When managed well, renting out your property can provide fantastic income. It also allows you to travel overseas for a longer duration without completely uprooting from New Zealand. Being a landlord for the first time can be daunting; choosing the right tenant, advertising, and sorting out tenancy agreements & bond. Once the property is rented, there’s still plenty of ongoing work involved in maintaining the house and surrounding area. If a tenant has an issue or forgets to pay rent this can take a fair bit of time sorting out. With this in mind, using a property management agency in Christchurch is highly recommended. Compare the cost of property management fees with the amount of time and stress you have to deal with and it quickly becomes clear that it’s worth going through an agency. 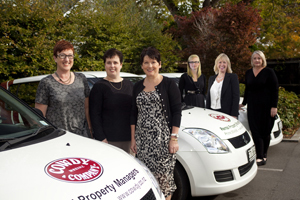 Our certified team has a wealth of experience in and knowledge of Christchurch property management. We know all the typical issues that might come up during the tenancy and how to fix them. If you ever have any questions about being a Landlord we can answer these straight away. We’ll interview each applicant to determine suitability, as well as running a thorough reference and credit check. Cowdy ensures that the tenant pays rent for your Christchurch home in advance via automatic payment. This will usually be on a weekly or fortnightly basis. Funds are initially transferred to our Trust Account which is voluntarily audited, ensuring your funds are protected. We deposit the rent into your nominated account on the 1st and 15th of the month (or closest working day). This will have our fees already taken out – you don’t have to worry about doing a thing! Tenants need to report any repairs required. We’ll have one of our highly-trusted tradesmen repair the issue. If the cost is going to exceed $400, we’ll contact you first. If the tenant has caused damage to the property, don’t worry – we’ll follow them up for payment of this. Cowdy operate on the core principles of trust, honesty and integrity. We understand that your home is likely your most-valuable asset and take this into consideration with everything we do. This means finding a great tenant, maintaining the property to an excellent standard and processing payments in a timely manner.